G Suite has made tremendous inroads into the IT landscape. What started as a free email product for consumers has turned into an enterprise class productivity suite. It’s done so well that it forced Microsoft to have to adapt and respond with their version of a productivity suite: Office 365. The challenge for IT organizations, though, is how to effectively manage Google identities. Google doesn’t want to be a full-fledged directory. That’s why many organizations are leveraging Cloud Identity and Access Management (Cloud IAM) tools that act as a fully-featured directory and offer the function of G Suite Integration. G Suite is being used by over 5mm businesses today, and it has changed the IT landscape irreversibly. Google Apps (GApps), as it was formerly known, first took root with the startup community. Organizations that didn’t need the capabilities of the enterprise-grade Office suite, and were comfortable with less functionality in their documents and spreadsheets, adopted GApps en masse. GApps was cheap and there was no on-prem equipment required. More importantly, it took advantage of the cloud to dramatically improve the capacity to collaborate. For organizations without legacy infrastructure, going Google was an easy decision. As these organizations began to grow and larger organizations started to consider migrating to G Suite, there was an issue around how to centrally manage identities. Historically, the identity management function was solved by Microsoft Active Directory®. It paired well with Microsoft Exchange, the leading email server, but as the email server moved to the cloud the question became, “why keep Active Directory?” Could organizations move everything to the cloud including their identity management platform? Of course, the answer was no. AD didn’t lend itself to being hosted in the cloud, and Azure Active Directory was not a replacement to the on-prem Active Directory. G Suite Directory isn’t an alternative to Active Directory, and neither is Office 365’s user management platform. So, most Google customers have been stuck on what to do about user and identity management. Fortunately, a new generation of identity and access management solution has emerged. This segment of IAM is called cloud identity management. The specific platform is called Directory-as-a-Service, and it acts as a replacement to Active Directory. Effectively, it becomes the companion to G Suite, and controls the provisioning and deprovisioning of users at G Suite as well as other IT resources. Perhaps the most significant benefit of integrating cloud identity management with G Suite is that the entire IT infrastructure shifts to the cloud. IT admins don’t have to deal with the on-prem, legacy solutions of Exchange and Active Directory. 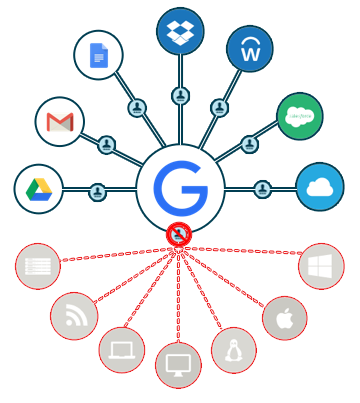 IT admins simply connect the Directory-as-a-Service platform to G Suite and have control over onboarding and offboarding of users. 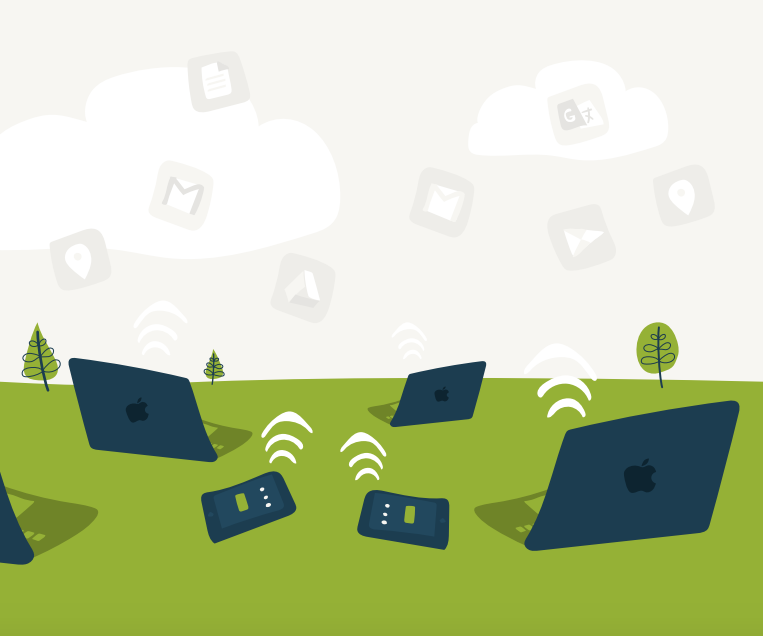 The same identities that are used with Google can also be used for a user’s system (Mac, Windows, or Linux), cloud servers hosted at AWS or Google Cloud, web or on-prem applications, data, and the WiFi network. 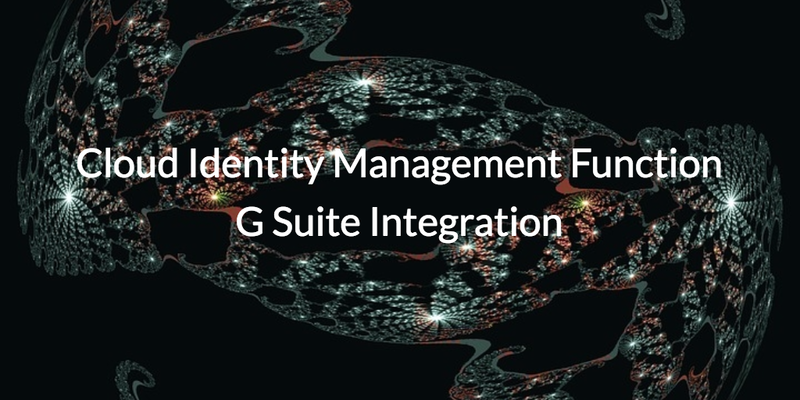 In short, the cloud identity management function G Suite integration is more than just for G Suite. The cloud identity management platform becomes the central identity solution for the entire organization. If you would like to learn more about how cloud identity management and G Suite integrate, drop us a note. 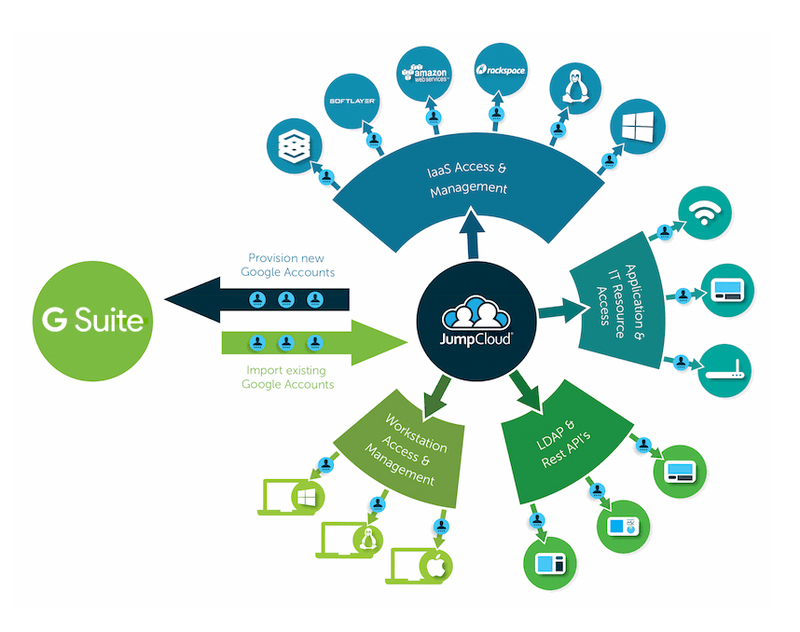 Alternatively, give JumpCloud’s identity-as-a-service platform a try for yourself. Your first 10 users are free forever.